PRODUCT: GENUINE IGLOO #8147 (formerly #9590) REPLACEMENT PUSH BUTTON FAUCET / SPIGOT ASSEMBLY WITH GASKET, SEALING WASHER & NUT. FITS ALL 1 - 10 GALLON IGLOO BEVERAGE / WATER COOLERS (and most other brands), as well as many other free-standing water dispensers. PRICE/EACH. 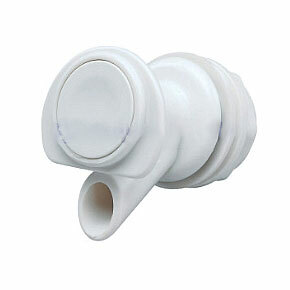 DESCRIPTION: This is a superior replacement part for many water coolers. It features a rugged front push button. (Top plastic handle types of faucets are easily broken and worn). Includes a new sealing gasket, sealing washer and plastic nut. DIMENSIONS: The screw thread outside diameter is 0.86". The length of the threaded shank is 0.80"